My mother-in-law says I’m going to have my hands full. My sister-in-law says it’s curiosity which leads to learning. I call it Trouble, with a capital T! Davey has his hands into EVERYTHING. It doesn’t matter if it’s a spider, a glass of milk, car keys, my iPhone, my plant, the television, or even the padding on the fireplace hearth. This kid literally MUST touch everything that crosses his line of sight. It’s exhausting! Last week, Davey decided to go exploring. 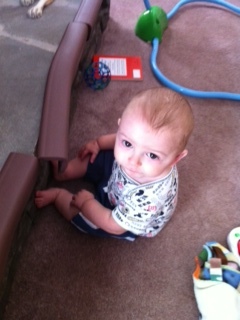 I have yet to see him actually crawl, but he’s getting around quickly somehow. I can put him ten feet away from something, and within a matter of 30 seconds or less, he’s already navigated his way to the object that has caught his eye. His first exploration was the blankets on the shelf of the coffee table. I can actually be blamed for this as I was trying to see how he would handle himself while holding on to the coffee table. I watched as he held on tight and even tried to jump up and down a couple of times. He looked around, inspecting the table and all of its little intricacies. It was at that point that he found his blanket and decided to pull it off the shelf. I actually laughed at this one. After all it was harmless. The next exploration came as I put him down on his blanket while I walked into the kitchen. For those of you who have been to my house, you know that my family room and kitchen are pretty much one open room. So, when I leave one to go into the other, I still have a clear line of sight. That is until I turn my back, which is what I did for a couple of minutes. During this time, Davey made his way over to the fireplace where he started pulling off the padding we had put in place to protect him should he fall. When I caught him, I scolded him. And while he had a guilty look on his face and even seemed to be somewhat remorseful, he immediately went back to trying to pull the rest of the padding off. The next day, I put Davey down long enough to go to the bathroom. While in the bathroom, Davey made his way over to my plant stand that holds my flowing, vine of a plant (I don’t have a green thumb, so I couldn’t tell you what type of plant it is), and had entwined his hands into the vine and tried to pull it off. My heart stopped and I could see the plant coming down in slow motion on top of his head, shattering the pot and busting open his head. I yelled at him from across the room as I ran towards him. Did he stop what he was doing? Nope. He continued to try to pull. Everyone tells me that I’m going to need to move things out of his reach, but my mother never did that with me or my brother. She left everything out and she told us “no”. Some moms frown upon telling their kids “no” because it stifles their curiosity and exploration. I want to encourage Davey, but he can’t touch everything. This is only the beginning, I’m sure, and I’m even more certain of the fact that I’ll soon be losing those remaining few pounds of pregnancy weight as I’ll constantly be on the go chasing after him, the one who spells his name T-R-O-U-B-L-E. The Terrible Twos…At 7 Months?? ?